C'mon in, take yer shoes off, and set yerself down. Here you will find comics, cartoons, musings, rants, . . . whatever strikes my fancy, or "Spins my Plush", so to speak. This post may go too far, but I've had a really bad day, and I feel like expressing it. Last year, two of my uncles passed away. 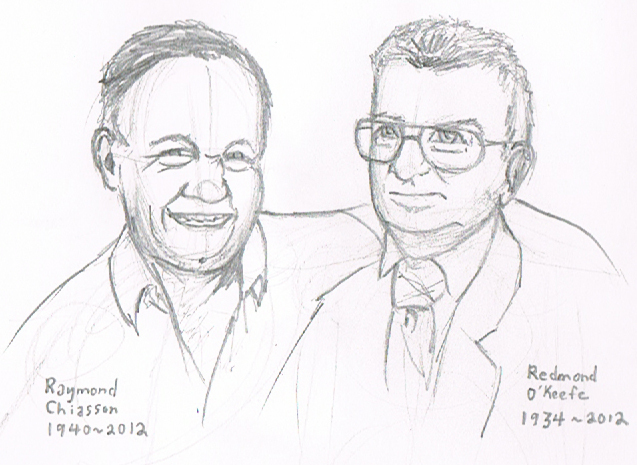 Raymond and Redmond. I only realized later how similar their names were, even though they could not have been more different. Redmond was well educated. A quiet, reserved teacher with a great sense of humor. A man whom when he died the only word that I could think of was "good". Always full of life, when he suffered a debilitating stroke, it felt like all that humanity was trapped. But a love of life still remained. He had difficulty talking but could still express his every emotion. When my dad died, Redmond and his brother Greg became as close to a surrogate father as my brother and I had, even while their sisters disowned us. Raymond was not known to be educated, even though it turned out he graduated from the Nova Scotia Agricultural College as a meat cutter . . . making him posthumously an alumnus of Dalhousie University. Raymond had a hearing disorder that resulted in him having difficulty talking. To be honest, I was always scared to talk to him, because I could never understand him. But for all the comments on Raymond's intelligence . . . jokes or not . . . I truly believe him to be one of the most intelligent men that I have ever known. Raymond knew what was important. He drank and smoked until the day he died. While all who knew him told him that it would catch up to him, Raymond lived himself to death. He never harmed a soul, but he knew that we only live life once. And when he left, he left without a regret. I can only hope that when I die, I die half the man of either of my uncles. Sooo . . . last page I have drawn. I always seem to get a headache on Saturday. Kind of like a viral hot knife through butter. Know what I mean? I hope not, 'cause I sure don't. I should mention that Dani's, "EEEEEEEEEE", was the hardest line that I've ever had to write! She's a headstrong, competent young woman. I just can't see her letting loose with a stereotypically girly, "EEEEEEEEEE!!!" But "AAAAAAHHHHHH" didn't seem right. And she just snapped out of a groggy faint, so it just didn't seem likely for her to formulate, "Foresooth! What strange sight sets before my eyes?" Maybe, "WHAT THE F@#$!?!" But, is that really sitting on her lips as she can barely focus her eyes? If anyone's still reading, maybe you can give me some feedback? Yeah, sure. Like anybody's still reading! A professional engineer and amateur artist. A riddle wrapped in an enigma, buried in a puzzle under a question, topped by a mystery hiding behind a conundrum. I speak and say nothing. When mute, I speak volumes. And I like wind and fuzz.